Ball kid tennis secrets, as told by a former ball boy. "She refused to accept balls from me": The secrets of a former ball boy. May I marry Roger Federer… please? How, exactly, can someone be ‘bored’ while playing at one of the world’s most prestigious sporting events? But perhaps most curiously: What’s the deal with the ball boys/girls? Who are they? What do they do? What are their secrets? We spoke to a former ball boy, Jake*, who told us exactly what it’s like to pick up and throw some of the world’s most famous tennis balls. According to Jake, who’s now a 26-year-old lawyer, he wasn’t paid for his role as a ball boy in the early 2000’s. Oh… I’m sure flap caps from a major tennis tournament make for very cool attire to wear out on the weekend. Even now, ball kids aren’t paid, but they get a food allowance as well as free tickets for family and friends. And, yes, they still get to keep their cool on-court gear. Jake was 11 when he was a ball boy, and he remembers some of the others being as old as 15, but there weren’t any below 10. He assumes this is the rough age bracket required to be ball kid. “You didn’t need to be particularly fit,” he explained. “We only did 40 minute stints at a time on the court,” so the major factor was whether you could withstand the heat. It sounds like this might have changed in the years since - especially for the Australian Open. 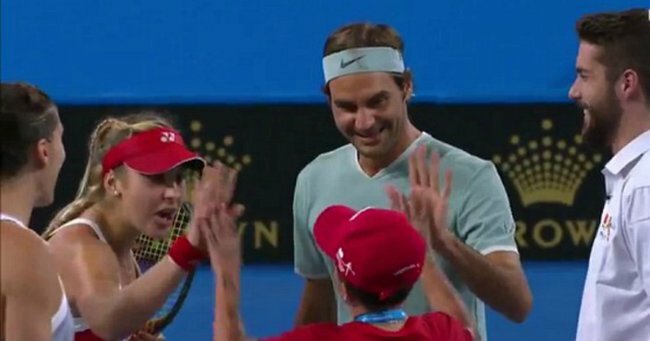 The ball kids this year reportedly underwent a 12 month, rigorous selection process, and months of training, with an international contingent joining the successful Australian applicants. Although, the selection process sounds fairly similar to what Jake described. The Australian Open says the international kids undertake a selection trial weekend, involving on-court drills and written tests. Did anyone ever lose their cool at you? One well-known Australian tennis player “lost it” at Jake at the Adidas International. “She ran into me when she was trying to get a ball close to the net,” he said. Another Russian female tennis player had a very specific problem with Jake. What do people not know about being a ball boy? It’s incredibly competitive, says Jake. “More matches are played on Centre Court (i.e. televised) in the second week,” he said, so he has a theory about why he never made it to the finals as a ball boy. Finally, Jake thought there’s something else everyone should know about ball kids... and it has to do with going to the toilet. Wait… ball kids WEE on the court?! “I guess trying to make it to the finals pushes them to their limits,” Jake said.